Today: The mysterious powers of corn milk. 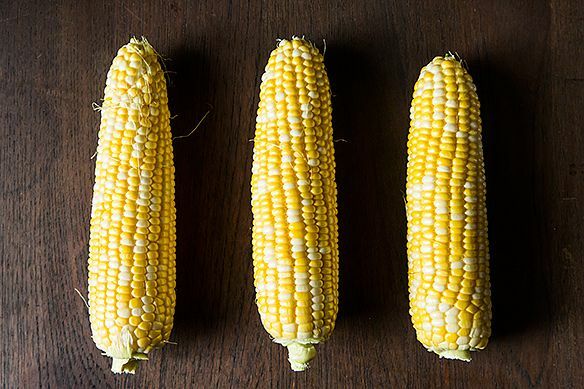 Gem-like rows of corn niblets, still stuck to their cobs, can be pretty miraculous even in their simplest, untapped form. But the real magic happens inside. The sweet starch that's trapped inside those translucent kernels is a powerful substance, once unleashed. As creamy as half-and-half (with much more flavor going for it), it also thickens up quickly when heated -- faster than reducing cream, faster than a floury roux, and even faster than its comparatively decrepit cousin, corn starch. And it's just sitting there, waiting to be set free. We've already seen corn milk put to work in Yotam Ottolenghi's fresh corn polenta and Whitney Chen's corn butter. It can be used as a pasta sauce and shows up in the soothing Vietnamese drink s?a ngô too. FOOD52er gluttonforlife even told me about a corn pudding that's literally just fresh corn slush, baked in a cast iron pan until it's thick and cakey. But my favorite new means of getting my corn milk comes by way of another FOOD52er, JessicaBakes. 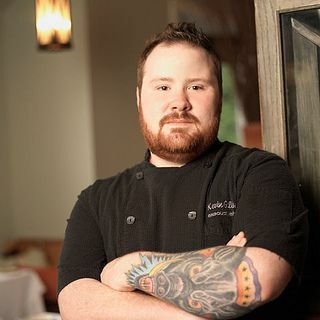 She tipped me off to this recipe from Top Chef almost-winner Kevin Gillespie (you remember, the lovable, talented one whose beard has its own Facebook fan page?). 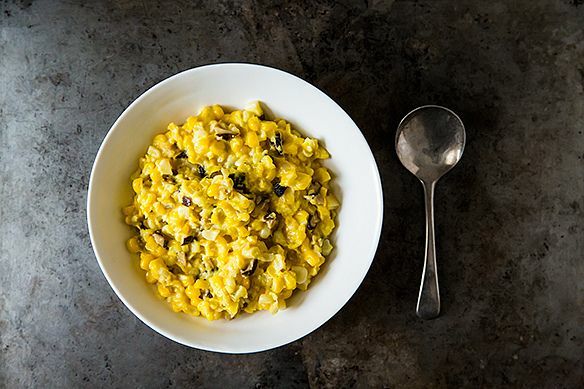 He makes a cream-free creamed corn inspired by his granny, with some modern tweaks. Classic creamed corn -- that thickening of cut corn just till it's spoonable -- has been known to get its creaminess from places other than cream: milk, cornmeal, bacon and crème fraîche, to name a few. But the purest cream of all, as we've seen, can be distilled from the corn itself. 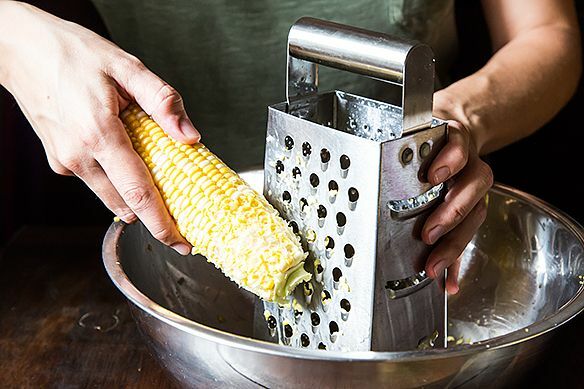 To max out the corn milk factor, Gillespie grates half the ears on a box grater, and shears the kernels and "milks" the other half, then cooks it all for a few minutes, stirring till it gets thick and glossy. He also seasons it perfectly. 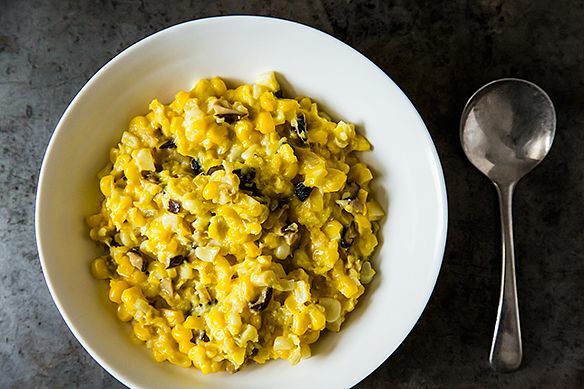 Corn at its peak can be so sweet that it barely makes sense as a vegetable side, but here the earth of dried shiitake mushrooms anchors it, softened shallots and garlic give it some savory bones, and lemon juice dials up the tart to keep our palates from drowning in sweet corny cream. Mushrooms might seem an unlikely partner, with peppy summer friends like tomatoes still hanging around, but they make this the perfect late-summer-slumping-into-fall dish, as ready to pair with roast chicken as with cheeseburgers. This looks absolutely amazing and love that it's dairy free! Very tasty though not the creamed corn my taste memory has come to expect. 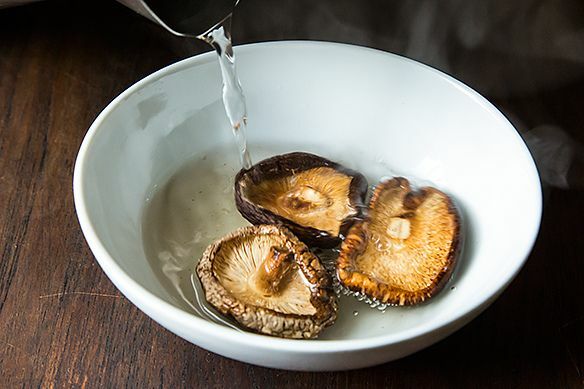 Love the earthy taste of shiitake mushrooms. I have made this since the recipe appeared in Food $& Wine and loved it. Recently served it at a party at room temp and it worked great as a salad. I just did an old recipe for corn souffle without cheese or flour and loved it... the starch in the corn does all the work and makes a gorgeous texture. It's remarkably versatile, isn't it? I'm from south Alabama and this is how I was taught to make it as a child as well. We always just used the back of the knife to scrape the ears. I learned this technique many years ago from my grandmother (I am 57) who lived in south Alabama and north Florida. 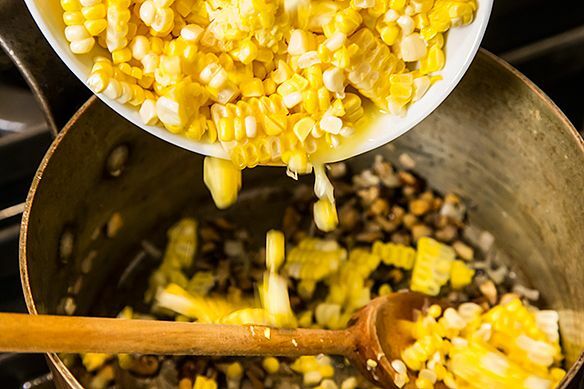 There is NO better way to make creamed corn. I never add sugar or milk. Just salt and pepper and a little butter. ALSO, you can do this in the microwave and it is fabulous! 8 ears takes about 10 minutes on high, stirring about every 3 min. It is fabulous! Your guests will think you are magic! Hey thanks for sharing the microwave tip! Hi there--looks tasty! 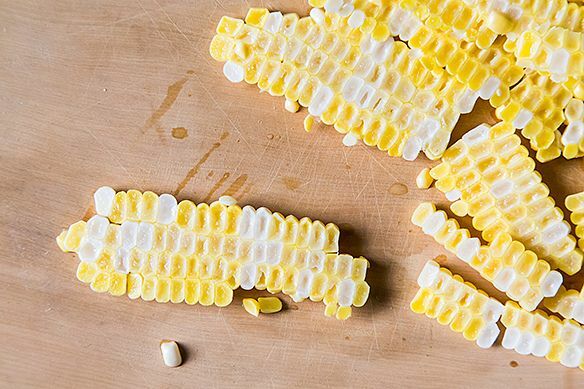 Can frozen corn kernals be used? You'd miss out on the corn milk that's left in the cobs, but maybe by blending part of the frozen corn, you could get close. Let us know if you try it! This looks incredible! Not as simple as the skillet version but love the combination of flavors. Yes!!!!! So glad this made it on here! I actually took a business trip to Atlanta last month solely so I could have a chance to dine at Kevin's restaurant. It was incredible. I'm so glad he's getting his props here! Thank you again for the tip -- everyone here was pretty crazy about this one! love kevin! such a great top chef contestant and always came away with a delicious plate of food.